You want to play real money poker on your mobile windows phone? It shouldn’t be a problem in 2017, right? Most of the big poker rooms offer a mobile poker app. And Windows Phone has established itself as the number three mobile operating system. But do the best poker rooms really offer a Windows Phone Poker App, just like many source on the net make you believe? We took a close look and found out: There are some real money Windows Phone Poker Apps out there. But due to a very limit selection, you cannot be too picky. We have checked the mobile poker client of all the big poker rooms to find out, ith the poker app runs on a windows phone like Nokia Lumin 520 or above. In the following article we have written a short summary for every operator. If you’re from the UK, you might want to skip this and directly head to PartyPoker. They are the only big poker room to offer a native windows phone poker app. Windows Phone Poker App – yes oder no? Can I play PartyPoker on my Windows Phone? As one of the few bigger poker romms PartyPoker has managed to launch a dedicated windows phone real money poker app. The full native App is available in the Windows Store – but so far only in the UK. Playing PartyPoker on your Windows Phone via mobile browser is not possible. The app was launched in early 2016. So we think that there is still a good chance that more countires will follow. We will update this page as soon as the Party Poker Windows Phone App is available in more countries. mFortune is a british casino operator that offers a real money poker app for a couple of years now. The limits and stakesare unusual. And the app doesn’t really leave an up to date impression. But a sound argument for mfortune is, that the game runs on nearly every smartphone you can imagine. mFortune is the only available real money poker room for windows phone in many countries. And as they offer a no deposit bonus, it’s absolutely worth to give them a try. Is there a 888 Poker Windows Phone App? 888 Poker is the second largest poker room and is very popular all around the world. The 888 poker Android App and the iPhone App are among the best mobile poker rooms available. But we regret to inform you, that 888 poker is not available for Windows Phone so far. Even the webapp that runs directly in the mobile browser does not run on Windows smartphones like Nokia Lumia 520. The operating system does not meet the requirements of the app. Does bwin offer a mobile poker app for Windows Phone? Bwin is one of the biggest bookmakers worldwide and offers a great poker app as well. But so far bwin has failed to launch a mobile Windows Phone poker app. If you’re a punter, you can place your bet on Windows Phone at least. If you are looking to play poker only, PartyPoker is the better place to go – at least when you’re from the UK. How about an Iron Poker Windows Phone App? There are a couple of poker apps that belong to Playtech’s iPoker network. In place of all the other apps like bet365, Winner, Ladbrokes, betfair and other tried the new and up to date Iron Poker App on our windows phone. We regret that we have bad news here, too: Iron Poker in special and iPoker Apps in general are not working with a mobile Windows Phone. We managed to open the Iron Poker App on a windows phone – but it did not load correctly and the screen was frozen. As soon as the App gets a technical update and runs on Windows Phone, we will update this page immediately. Is there a PokerStars Windows Phone App? Even the market leader PokerStars has not managed to launch a mobile poker client that runs in Windows Phone yet. 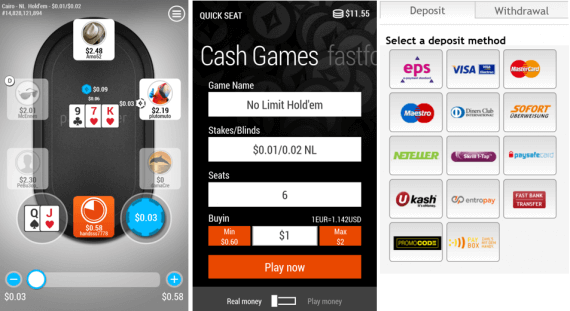 PokerStars has put a great app together with a huge variety of poker variants. But as long as you do not own a Android phone or and iPhone, you won’t be able to be part of the show. If you find some Apps that pretend to be PokerStars on the Windows App Store: be cautios. When we last checked if they were legit, all of them turned out to be fake apps that were only build to advertise for free. The PartyPoker App is currently the best Windows Phone Poker App. But it is only available in the UK so far.